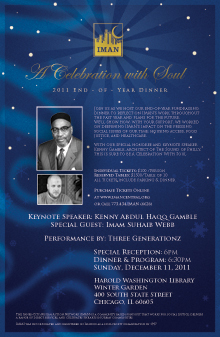 IMAN will close out 2011 with a fundraising dinner on December 11, 2011 at the Harold Washington Library Center Winter Garden honoring one of the most prolific contributors to American culture of the past half century and one of the most successful community developers of the last two decades. Kenny “Luqman Abdul-Haqq” Gamble, a Rock and Roll Hall of Fame inductee, is an icon and a legend in American pop music and an inspiration for everyone working in the fields of urban renewal and community development. He will be joined by our Special Guest Imam Suhaib Webb, Special Honorees Rabbi Robert Marx and Jane Ramsey, musical trio Three Generationz and renowned street artist El Seed. Blessed by the presence of scholars, activists and artists, the event will be, in true IMAN form, A Celebration With Soul. Over the course of three decades Kenny Gamble became, along with partner Leon Huff, one of the most prolific and influential song writers this country has ever known. Together they penned over 3000 tracks, producing dozens of #1 R&B and Pop singles and over 150 platinum and gold records. Gamble’s work ethic and commitment to his art has earned him an induction in the National Academy of Songwriters Hall of Fame, as well as the Grammy for Lifetime Achievement. With his musical legacy solidified, in 1993 he co-founded Universal Companies with his wife Faatimah and embarked on creating a multi-faceted community development and urban renewal program that is reshaping an entire neighborhood. On December 11, IMAN will bring together a group of dynamic leaders whose community service has spanned the last 50 years. The night will be complemented by the smooth jazz of Zzaje, the inspiring visual displays of eL Seed and the beautiful voices of our Native American Muslim sisters of Three Generationz. Purchase your ticket today and join us for A Celebration With Soul. This entry was posted in News and tagged A Celebration With Soul by IMAN Staff. Bookmark the permalink.